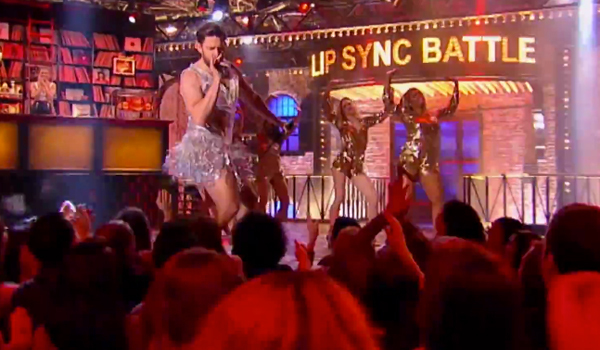 Spike TV’s Lip Sync Battle has been teasing a big performance from Anna Kendrick for weeks. This week, the Pitch Perfect 2 actress popped up onstage for an epic battle against The Office’s John Krasinksi. Amazingly, during the costume-filled second round, both actors really got down and shook their butts, and Kendrick absolutely crushed it out with a rendition of Jennifer Lopez’s “Booty.” Check it out, below. We all should know at this point that Anna Kendrick rocks at performing, even when she isn’t using her incredible vocal prowess. Her performance begins at the 3:23 mark, and she absolutely dominates the stage in a black jumpsuit, strutting her stuff just like Jennifer Lopez would. Speaking of J-Lo, I don’t know how Kendrick did it, but she convinced the singer and American Idol judge to also appear onstage toward the end of her song. John Krasinski had to have known his own lip syncing work was futile at that point. You just can’t compete with two women working their derrieres. Not that Krasinki’s performance is dull. The man chooses to do “Proud Mary,” but not the original John Fogerty-sung Creedence Clearwater version. Instead, he dusts off the Tina Turner version of the song and does a great job of singing the slower opening portion of the track before ripping off his suit and revealing a ridiculous women’s stage costume underneath. We’ve seen it in the promos, so many people may have already known it was coming, but knowing something is coming and actually seeing it in action are two totally different things. Anna Kendrick’s J-Lo introduction definitely helped her to pull off a win this week, but Krasinki and Kendrick’s battle was certainly one that will fondly be remembered. So far Lip Sync Battle has really been pulling out all of the stops, with Anne Hathaway doing a great Miley Cyrus impression, Dwayne “The Rock” Johnson attempting some Taylor Swift and much, much more. If you haven’t headed over to Spike TV in recent weeks to check out the new series, we highly suggest you give it a watch. You can catch new episodes of Lip Sync Battle on Thursday nights at 10 p.m. ET, only on Spike.